Dansig’s Hot-Rod Howa – Forum member Dansig has been busy during the long, cold winter in his native Iceland. 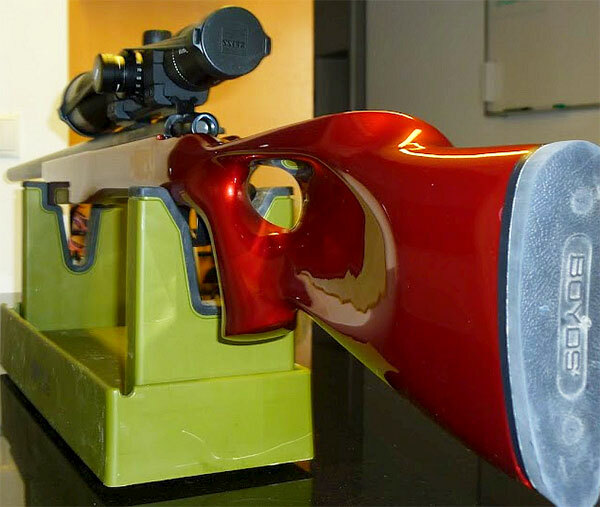 He transformed a homely-looking Howa m1500 Axiom into a beautiful candy-red thumbhole Varminter that shoots in the threes. This was truly a “labor of love” that required many dollars invested and dozens of hours of home-workshop labor. But the results speak for themselves. Dansig now owns what may be the best-looking Howa on the planet. And this rig isn’t just a beauty queen — it’s very accurate as well. With a new Krieger barrel chambered in 6mmBR Norma, the Howa shoots repeatable, five-shot groups in the threes, and Dansig has managed a few “wallet groups” in the low twos. To this beauty … All it takes is imagination, hard work, and the right components…. For this project I acquired a new Howa m1500 axiom. The transformation began with a $99.00 (USA retail) Boyds’ thumbhole stock. When I got the stock, I found that even the standard barrel was too big for it, so I had to modify it quite a bit. To help ride the front bags, I added a wood block to make the fore-end wider, and to provide a flat section in the front. This required cutting the sides of the fore-end to mate with the wider block, which was glued in place. I also added an inch to the stock length. Then it was time for the paintjob ($270). The multi-coat finish was applied by a professional, using car paint and clear coat so it’s very strong and scratch resistant. 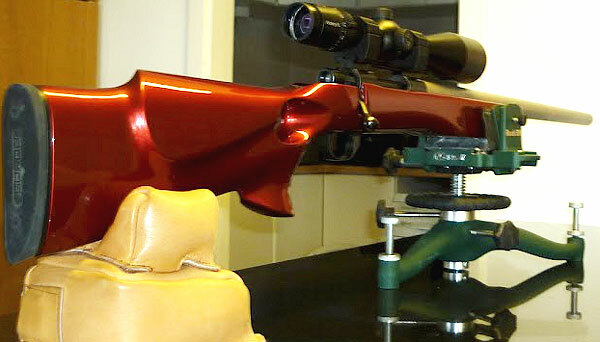 The color was a customized red with gold metal-flakes, and it looks awesome on a gun. While I was working on the stock I took the action to the local gunsmith. 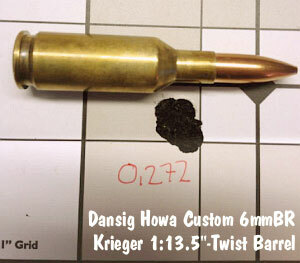 He fitted a new 1:13.5″-twist Krieger HV barrel and he put a sleeve in the action to make it tighter. 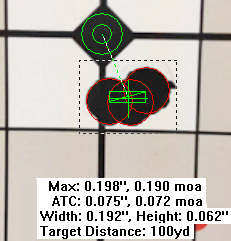 He also tuned the trigger, taking it down from 56 ounces (ouch!) to just 14 ounces. Finally, my smith bedded the stock before I took it in for the paintwork. And this is the finished product of very hard labor. The project was a lot of work, mostly because it was all done by hand and not with machines. I may do a similar project again, but I would make the stock from oak or other strong wood. The wood I used is a bit soft for this kid of project. Editor’s Note: Groups shown were shot on Caldwell “Tip-Top” laminated weatherproof targets, which display a distinctive punch — similar to a wad-cutter hole — as opposed to the standard gray donut smudge on a normal paper target. The holes appear black because the targets were placed over a black background sheet before being photographed. Share the post "Amazing Make-Over Transforms Homely Howa into Sizzling 6BR"